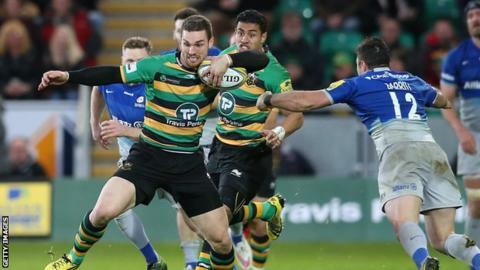 Northampton Saints will not panic despite a poor start to the Premiership season, says boss Jim Mallinder. Saints, who finished top last season, are 10th in the table following Saturday's 12-6 home loss to Saracens. "It's not as if we're a disaster and getting thrashed by 50 points every week," Mallinder commented. "We have made a few mistakes and not played as well as we can, but we know we're a good team, we know we can get better and we know we can win games." He told BBC Radio Northampton: "We're still positive, we're going to stick together, not panic. It's very disappointing to start this way but we have a good chance to get it right next week." Saints lost in last season's Premiership semi-finals, and their only victory so far this term came against bottom club Newcastle Falcons. However, director of rugby Mallinder hopes a change in competition for Saturday's European Rugby Champions Cup opener against Scarlets will also change their fortunes. "We look back at some of the games - we shouldn't have lost to Worcester, we shouldn't have lost to Sale because we're not quite playing well enough," he added. "If you're not playing well enough, you don't quite gel, then you do lose games. It's probably nice for us that we go to another competition next week and hopefully that will give us a chance to get some momentum."